You may have people come into your life who try to discourage the dream God has put inside of you. When someone feels like they are drowning, they try to save themselves by pulling other people down around them. Persecution is a very real part of our Christian walk, but God assures us that He will be our light in darkness. Remember, it’s not flesh and blood we’re dealing with—we’re dealing with Satan and his plan to keep us from our destinies! Think about a hot air balloon. 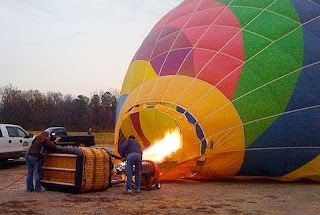 If you want a hot air balloon to go up, you need to put more hot air in it. If you put God’s truth over the opinions of the people around you, you are going to rise; those weights—regret, discouragement, and lies—have to fall off. Don’t let your circumstances weigh you down and choke out the Word— rise and shine! It’s our job to stand against the darkness so that we can raise each other up. God wants us to honor one another in love and be positive influences on the world around us. Your value is not about what you have or what you did. God says you are valuable, loved, and nothing will change the love He has for you. Let go; throw off those weights of self-pity, anger, and unforgiveness. Today is the day to stop living in the past. Drop the regrets. Rise and shine! There is a bright future ahead! Dear Lord, we thank You for Your light that shines in us. Help us to not let those around us discourage us or dim that light. Help us to fill our self with Your truth over the opinions of others. In the Name of Jesus, Amen.